Even though the goings-on in Wisconsin this year connected with collective-bargaining rights legislation have been front-page news nationwide for well over a month, the Associated Press has apparently concluded that folks outside the Badger State couldn’t possibly be interested in real threats of serious violence issued against Republican legislators who voted for it — and their families. 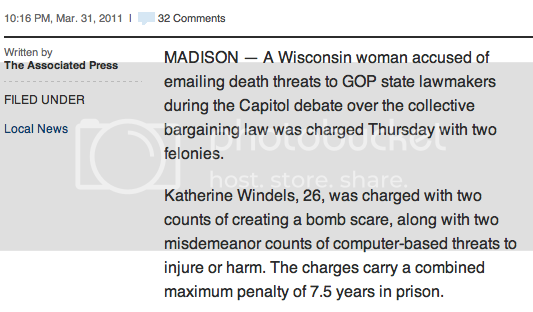 Guarding against the possibility that the publication involved and not the AP put the “local” tag on the story, a Google News search at 9 a.m. on ["Katherine Windels" "Associated Press"], sorted by date and with duplicates, came back with 44 items, the vast majority of which were clearly Wisconsin news outlets. The criminal complaint accuses the Cross Plains woman of sending two emails to senators threating to shoot them and plant bombs around their homes. The first message sent March 9 to Sen. Robert Cowles of Green Bay said the sender and others had decided to kill the Republican senator by “arriving at your house and putting a nice little bullet in your head,” the complaint said. The email also claimed the group had planted bombs around the senator’s house and car and the Capitol building. A similar email with the same threats was sent to other Republican senators two hours later. Both emails chastised the lawmakers for voting earlier that day for the budget repair bill, which strips most public employees of collective bargaining rights. The emails also praised Republican Sen. Dale Schultz of Green Bay, who was not sent a threat, as “heroic” for voting against it. — The threats were sent to 15 other senators. I think there was more than enough room in the story for three additional characters (a “1,” a “5,” and a space) to communicate that relevant information. — As has been noted several times, the legislation doesn’t strip all collective bargaining rights from affected employees, as the AP’s text above would lead readers to believe. As the wire service’s own Scott Bauer reported back in February, “Unions still could represent workers, but could not seek pay increases above those pegged to the Consumer Price Index unless approved by a public referendum. Unions also could not force employees to pay dues and would have to hold annual votes to stay organized.” That means some collective bargaining rights remain. 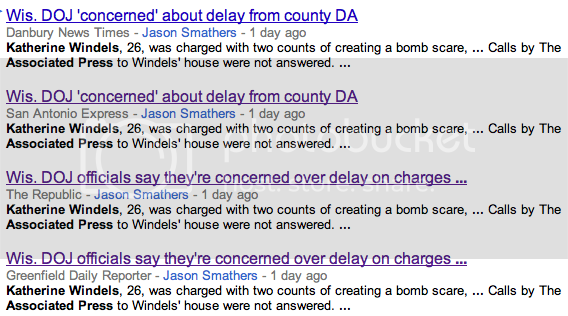 But clicking on each of the related stories (here, here, here, and here) takes one to the story previously discussed. Wisconsin Department of Justice officials say they’re concerned that a Dane County district attorney has not acted on a case involving threats to state lawmakers. DOJ officials say they referred criminal investigations regarding the threats to District Attorney Ismael Ozanne (OH-zan) two weeks ago, but Ozanne returned the referrals to resolve clerical oversights. DOJ says it resolved the issues and the referrals still sit with Ozanne. The department claims the reports have enough evidence to prompt criminal charges against one Dane County resident. How odd that the AP “somehow” didn’t mention that point in its coverage of Mr. Ozanne’s delay in having Ms. Windels arrested. Why, that’s almost enough to make you think that unionized AP employees, whose News Media Guild union has openly supported and demonstrated on behalf of Wisconsin public-sector employees, might be trying to shield Mr. Ozanne from scrutiny.